The Armed Forces Service Medal is a Bronze medallion 1 3/8 inches in diameter. 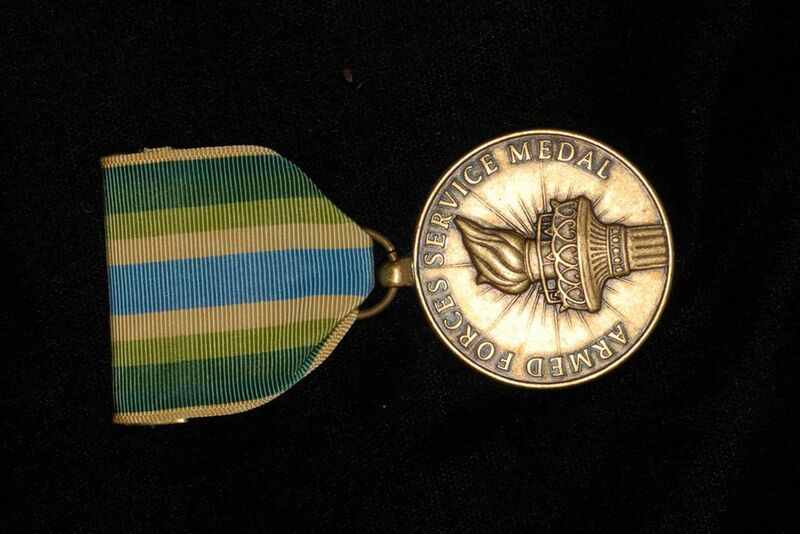 Displayed on the front is a demi-torch, resembling that of the Statue of Liberty bordered at the top with the words "Armed Forces Service Medal." Shown on the reverse side is an eagle, such as is on the seal of the Department of Defense, between a wreath of laurel at the bottom and the words "In Pursuit of Democracy" at the top. The Armed Forces Service Medal‘s ribbon is 1 3/8 inches wide and has eleven stripes: The first stripe is 1/16 inch of goldenlight, followed by 1/8 inch of jungle green, 1/8 inch of green, 1/8 inch of mosstone, 1/8 inch of goldenlight and a middle stripe of 1/4 inch of bluebird. The following stripes are 1/8 inch of goldenlight, 1/8 inch of mosstone, 1/8 inch of green, 1/8 inch of jungle green, and 1/16 inch of goldenlight. The Armed Forces Service Medal is awarded to personnel for actions in which no foreign armed opposition or forthcoming threat of antagonistic action was encountered, in operations in an area determined by the Department of Defense (DOF). A member of the Armed Services to be awarded the medal must have served as a member of a unit participating for one or more days in the operation with the designated area of eligibility. Other personnel to be awarded the medal must have been engaged in direct support for 30 consecutive days in the area of eligibility (or for the full period when an operation is less than 30 days duration) or for 60 nonconsecutive days provided this support involves entering the area of eligibility or have participated as a regularly assigned crew member of an aircraft flying into, out of, within, or over the area of eligibility in support of the operation. It was requested by the Office of the Assistant Secretary of Defense (Force Management Policy) (OASD-RMP) on March 2, 1995, that The Institute of Heraldry design a medal and ribbon design for an Armed Forces Service Medal. This medal was intended to be awarded to military personnel who had taken part in military operations of significant numbers that had no foreign armed opposition or forthcoming threat of antagonistic action, in operations in an area to be determined by the Department of Defense. The medal was proposed to meet a void in the criteria between the Armed Forces Expeditionary Medal and the Humanitarian Service Medal. The Armed Forces Service Medal was established by Executive Order 12985 signed by President William J. Clinton on January 11, 1996. The torch, taken from the Statue of Liberty, stands for the principles of democracy and for leadership and guidance. The eagle, taken from the seal of the Department of Defense, is a sign of the high degree of the award and what it stands for. Laurel represents for honor and achievement.